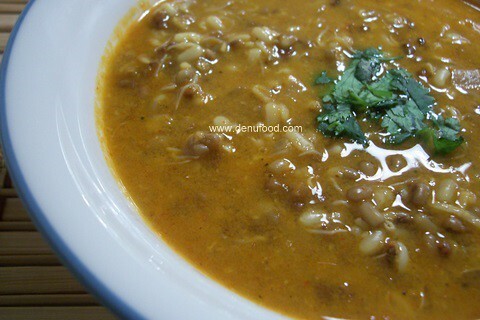 Sprouted moth beans are one of the favorite among the sprouted legumes. The moth beans or matki as they called is found in the cuisines of Maharashtra, north Karnataka and Gujrat where it is called as math. Sprouts are rich in digestible energy, vitamins minerals, proteins and enzymes. For more information about the goodness of sprouts you can visit here. This recipe is one of my favourite and tastes that much better with use of goda masala (a typical Maharastrian masala prepared at home, have not seen it available in any stores. The typical aroma of this masala is due to the use of spice called dagad phool, or stone flower). The first step would be to have the sprouts. It is quite easy to sprout the moth beans. *. Then rinse it with water and spread them in a wide container, with the lid loosely closed. **** 1 cup of moth beans would make about 5 cups of sprouts. 1.In a vessel heat oil, add the chopped onion and fry them till they start to turn brown. Remove half of these fried onions in a blender and keep aside. 2. Add the sprouted matki/moth beans to the vessel. Add turmeric, goda masala, chilli powder, water and let it cook(10 mins). 3. In the blender with fried onions, add ginger, garlic, cilantro, grated coconut(roasted), tomato and grind the mixture. Add this mixture to the vessel containing the cooking sprouts. 4. Add salt and water based on the consistency required. Let it cook for 15 minutes atleast. 5. Once cooked garnish with cilantro. Note: while sprouting, rinse the beans atleast 2 -3 times a day to avoid the sour smell. This is my entry to GYO Sep 15 by Andrea. It's really a good one. I will definately try this and then again I will post my comment. thank u.